One of the nice things about the holiday season is all the festivities and food. On Wednesday, December 9, I got to do something a little different—I went to a cheese-tasting event at The French Cheese Board on 39th Street in Manhattan. It’s a chic, clean, modern space where you can purchase your favorite French cheeses. The event was promoted by The Baddish Group, a PR firm that specializes in food and beverage marketing, and they offered a sumptuous spread of several different cheeses, from Camembert and brie to Raclette and butter made with sea salt. 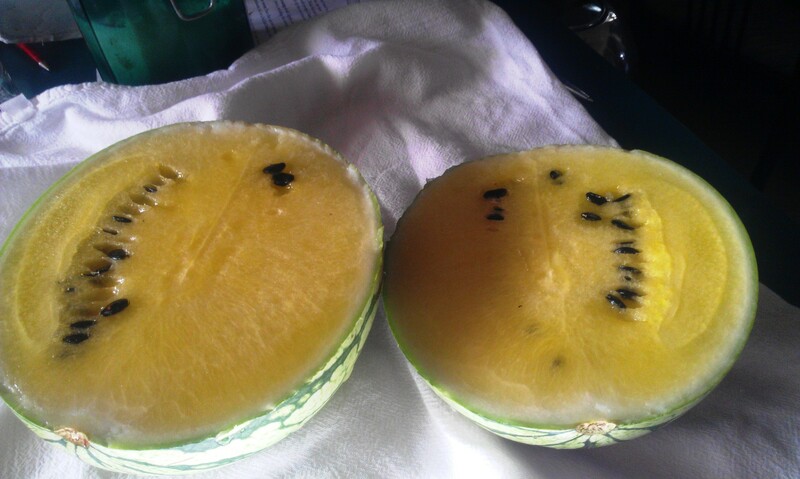 They were all so fresh and flavorful that I couldn’t help going back for more. I watched as others kept going back as well, which made me feel kind of bad for the kitchen staff. They were definitely being kept hopping trying to replenish the table. A server came by with a few different hors d’oeuvres: Mac & Mimolette, Brie and Grapes on a canape, and Raclette & Potatoes. The mac ’n’ cheese was so good in its simplicity, cheese and grapes is a classic combination that can never go wrong, and a potato slice with a piece of Raclette on top was divine. It was a warm, friendly gathering of people in different segments of the food industry. A couple of us were food bloggers, while others were buyers, chefs, and marketers. I’m sure that other professions were represented. Despite the incredible and uncharacteristic warm weather, a simple, lovely Christmas tree along one wall reminded us that it was the holiday season. I think that always puts people in a better mood. My favorite cheese, by far, was the Mimolette, a pumpkin-colored cow’s milk cheese. It’s a firm cheese, which is my favorite kind, but I really liked it for its smooth, sweet flavor. Which leads me to my favorite drink of the evening. They asked mixologist Natasha David from Nitecap, a bar on the Lower East Side of Manhattan, to come up with some cheese-inspired cocktails for the event. Natasha created cocktails that were not only inspired by cheese but that actually used cheese. And not just in the final concoction—her creations were made with spirits that were infused with cheese. 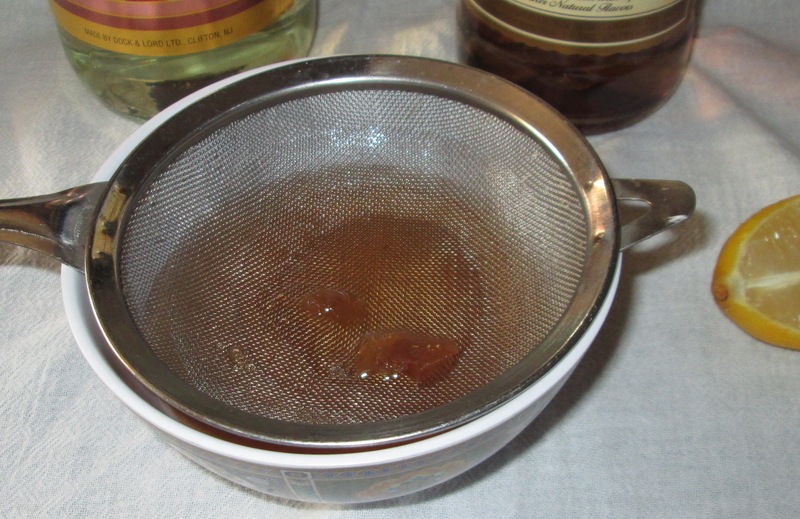 The infusions were quite simple—I let the cheese sit in the booze for a certain amount of time, then strained them and froze them so that all the fat would rise to the top and then strained again. I did that twice over 48 hours. For the Mimolette Rind—I used 50 g of rind to 1 750 ml bottle of Calvados for 7 hours. For Camembert—I did 60 g of Camembert to 1 750 ml bottle of Dorothy Parker gin for 5 hours. For Bleu—I did 50 g to 1 750 ml bottle of Linie for 2 hours. From there, the mixologists at the event concocted the three drinks below to accompany the hors d’oeuvres. I’m going to give an infusion a try at some point—it will definitely be a new experience for me. If you do it yourself, let me know how it turns out. Enjoy! This is my friend Tucker. He wanted to do something classy this holiday season. Categories: Alcohol, Appetizers/Hor d'Oeuvres, Beverages, Cheese, Cocktails, Events, Holidays, New-to-me Food, Recipes, Uncategorized | Tags: alcohol, beverages, cheese, cocktails, drinks | Permalink. It’s the last weekend before Christmas. For many of you, the tree’s been trimmed, the stockings have been hung by the chimney with care, the presents are wrapped and waiting under the tree, and the cookies for Santa have been baked. For many of you, this frenzy will continue for the next few days until Santa Claus is on the radar over Singapore. For both of these groups of people—and even for those who don’t like Christmas and feel that it’s a time of year you must endure—the best thing I could think to off this week is an alcoholic beverage. Apple cider is everywhere this time of year and it’s not unknown to add a dash or whiskey of bourbon to enhance its qualities. 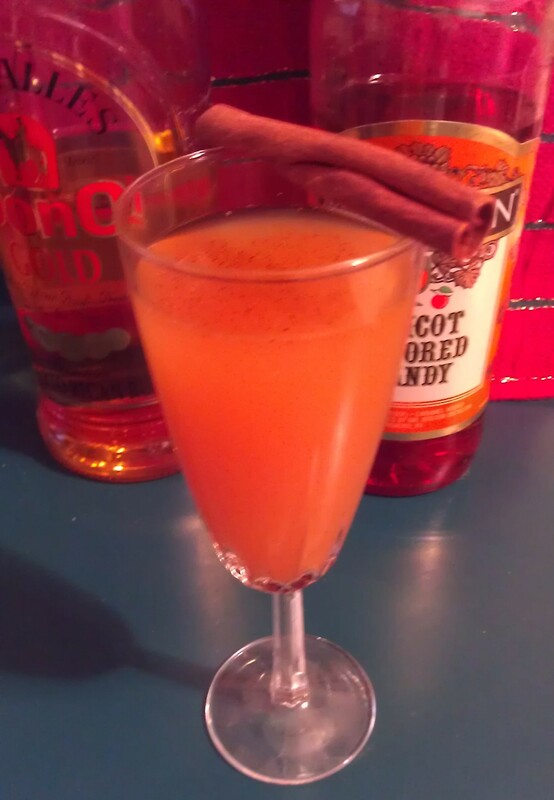 I thought I’d try something slightly different: apple cider, gold rum, and apricot brandy. Categories: Alcohol, Beverages, Experiments, Holidays, Recipes | Tags: alcohol, apple cider, beverage, christmas, drink, holidays | Permalink. If you’re still looking for a cool, refreshing, but yummy drink to serve at your Memorial Day picnic or barbecue, look no further. I’ve got you covered right here. I had this little bottle of coconut vodka that I wanted to use, and while I was out shopping the other day, I came across one of those coconut juice drinks with the little pieces of coconut in it. Hmm, I said to myself. I think this would be a great mixer for that coconut vodka. And that’s what I did. I poured the vodka over a little ice and added the coconut drink. It was okay but it needed something. 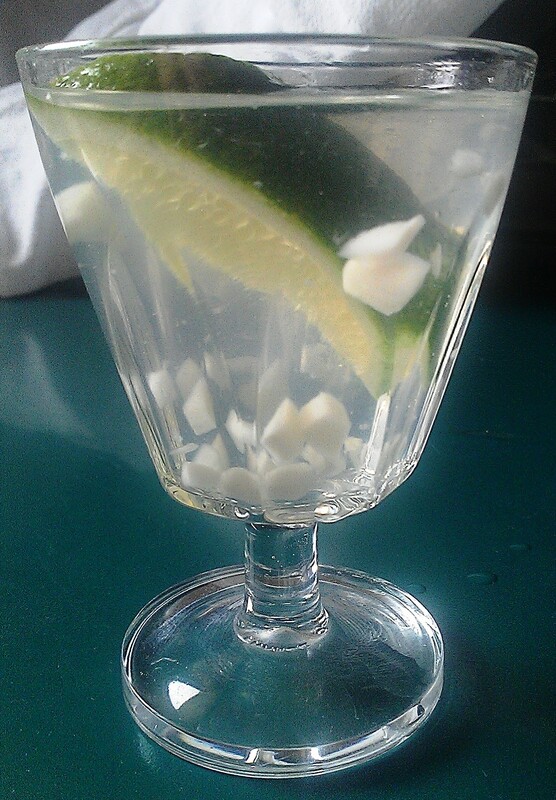 So I squeezed in some lime. That was it. Let me tell you, coconuts and limes are often paired together for a reason! They’re like Antony and Cleopatra, beans and rice, Abbott and Costello—they just belong together (well, at least the beans and rice and Abbott and Costello). So, here’s my recipe for a Coconutty-Limey Drink. 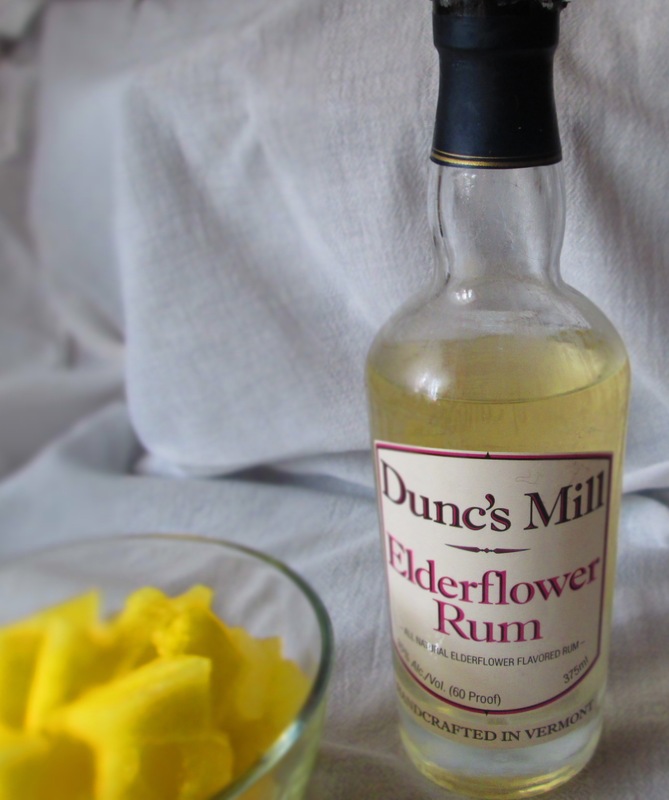 It serves one but can be batched, and it works well with coconut rum, too. Place a couple of ice cubes in a glass. Pour in the vodka and coconut drink. Squeeze in the juice from one wedge of lime. Squeeze in the juice from the other wedge and add the wedge to the glass Serve. Categories: Alcohol, Beverages, Experiments, Fruit, Holidays, Recipes, Uncategorized | Tags: alcohol, beverage, coconut, drinks, lime | Permalink. A few weeks ago, I bought apple slices canned in syrup. I used the apples in apple corn muffins (recipe HERE) and saved the syrup (because of its sugar content, it can stay quite a while in the refrigerator). One of my suggestions for the leftover syrup was to make drinks with it. I finally had a opportunity to try a couple out. I must say, they turned out deliciously, so I wanted to share them with you. 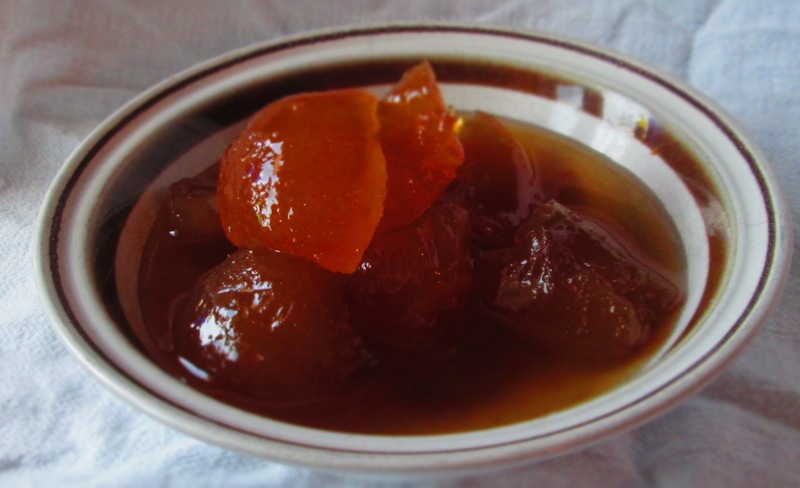 If you can’t find canned apples in syrup, you can make your own: Slice 2 apples and place them in a small saucepan with 1 cup water and 1/4 cup sugar. Bring to a boil; lower the heat and let simmer about 20 minutes, covered. Then strain the liquid out over a small bowl. So here are my successful apple syrup recipes. Both make 1 serving. Combine all ingredients, except cinnamon stick, in a shaker with ice. Strain out into a shot glass. 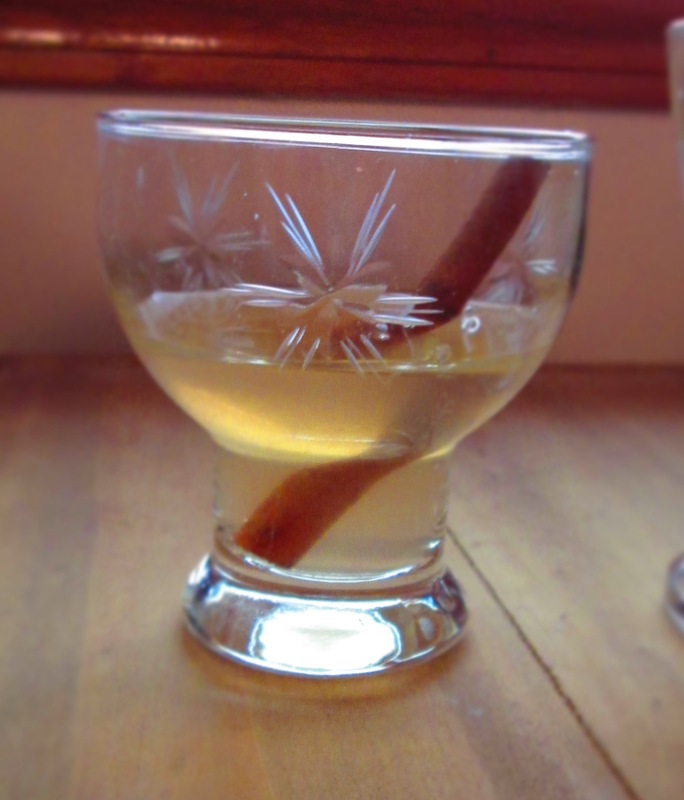 Place the cinnamon in the glass and serve. Combine all ingredients, except zest, in a shaker with ice. Strain into a small aperitif or cocktail glass. Categories: Alcohol, Beverages, Experiments, Fruit, Recipes, Uncategorized, Utilitarian Cooking | Tags: alcohol, aperitif, apples, beverage, cocktail, drinks, shooter, syrup | Permalink. This was a particularly difficult month and week for me, so I decided that this week’s recipe should be a cocktail. I had quite a few cocktails and glasses of wine this month to get me through, but this one turned out nicer than I had expected. 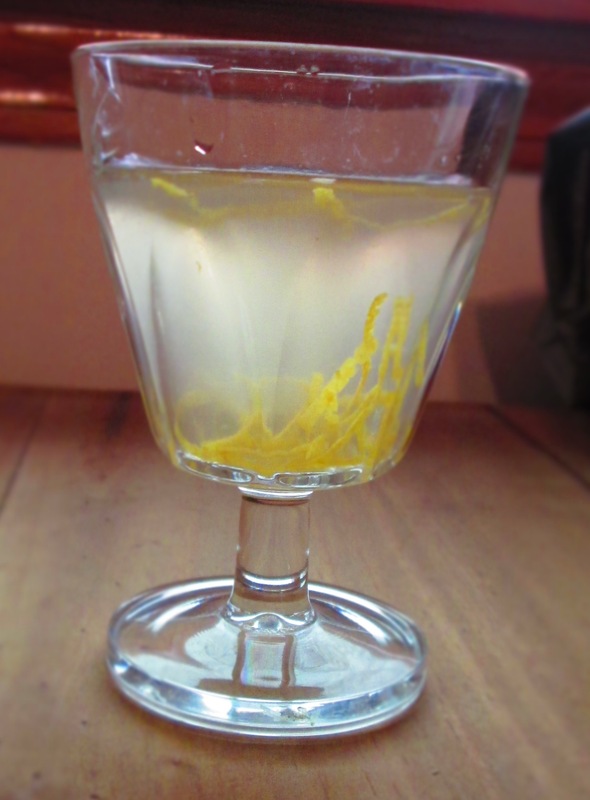 I used homemade limoncello, but any brand that you get from the store will do. It’s a bit on the sweet side, so give it a taste. If you want to tone down the sweetness, add a little less o.j. and/or a bit more rum. 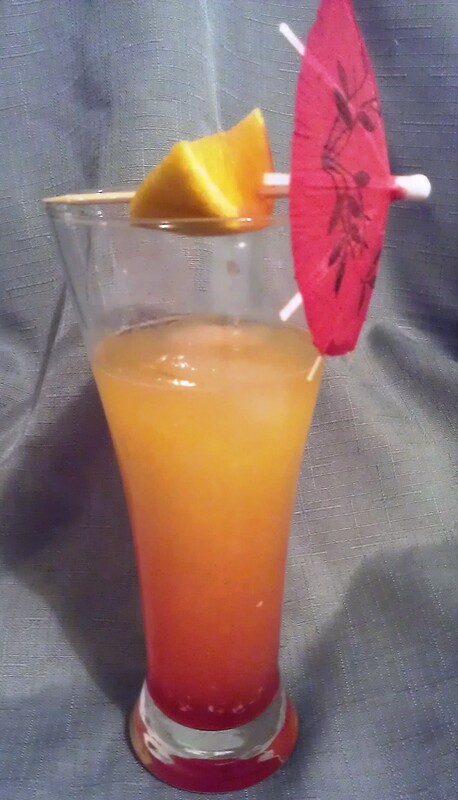 It’s called “sunrise” because it looks like one of those types of drinks that are reminiscent of…well, sunrises. Little umbrella optional. :- ) Enjoy! Place ice in a tall glass. Add the limoncello, rum, and orange juice and mix. Pour in the grenadine or syrup and let it settle at the bottom. Garnish the glass with the orange. 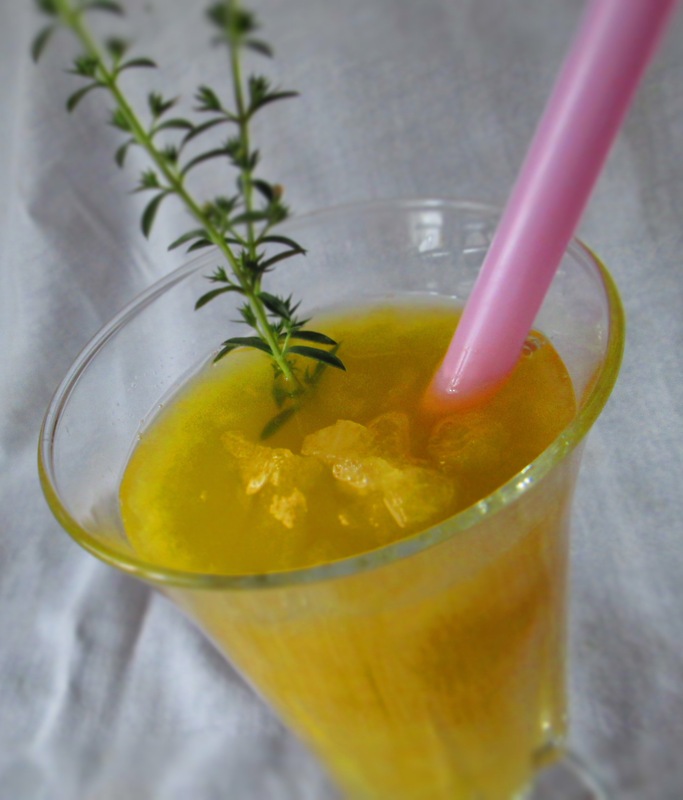 Categories: Alcohol, Beverages, Recipes, Uncategorized | Tags: alcohol, beverages, drinks, limoncello | Permalink.